Divide chicken mince into approximately 10 portions and shape into quennels. Sprinkle salt on top and refrigerate for 10-12 minutes. Heat 2 tbsps oil in non stick pan. Whisk eggs in a bowl with salt and green chillies. Pour this into the pan and cook, stirring, till eggs are scrambled. Remove from heat and set aside in a bowl. Heat 3 tbsps oil in same pan, add spring onion bulbs and onions and sauté till they are lightly coloured. Heat the remaining oil in another non stick pan. Add chicken quennels and cook till done. Add red and yellow capsicums and poha to onions. Mix well and cook for 1 minute. Add soya sauce, salt and scrambled eggs, reserving 1 tbsp for garnishing, and mix well. Add vinegar and spring onion greens. Mix well. 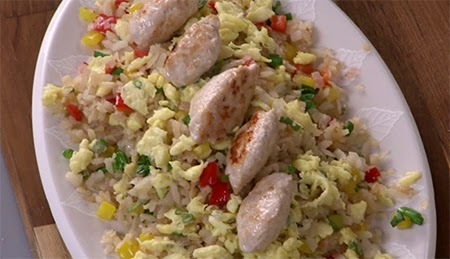 Place poha mixture on a serving dish, put the reserved scrambled eggs on top and arrange cooked chicken quennels over the eggs. Serve immediately.